Hitler's Gestapo Chief Lies In Jewish Cemetery, Scholar Says : The Two-Way The fate of Nazi war criminal Heinrich Mueller, who led Adolf Hitler's Gestapo, has long been a mystery. A historian says he's traced Mueller to a Jewish cemetery in Berlin. If confirmed, the discovery would end 68 years of uncertainty about the man who ran the secret police. 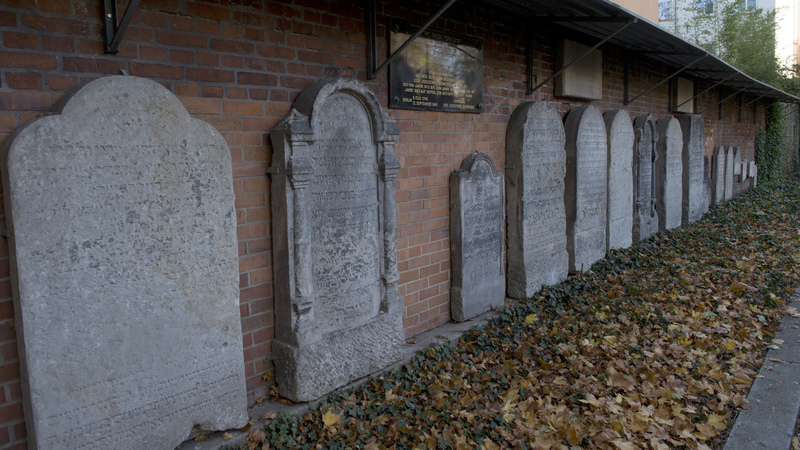 Dating to the 17th century, this Jewish cemetery may be the final resting place of Heinrich Mueller, the head of Adolf Hitler's Gestapo. A German historian says he has traced Mueller to the cemetery. The fate of Nazi war criminal Heinrich Mueller, who led Adolf Hitler's Gestapo, has long been a mystery. Now a historian says he has traced Mueller to a Jewish cemetery in Berlin. If confirmed, the discovery would end 68 years of uncertainty about the man who ran the secret police. After becoming the head of the Gestapo in 1939, he played a key role in carrying out the Nazis' "Final Solution," a plan to exterminate Jews. He "was last spotted in Adolf Hitler's bunker in Berlin the day after the Nazi leader committed suicide in 1945," Reuters reports. The news agency also notes that Mueller had been known to say he would never be captured alive by Germany's enemies. He is now believed to be in a mass grave in a historic Jewish cemetery in central Berlin. "Mueller, who was an SS Gruppenfuehrer — roughly equivalent to a major general — was sought for decades after the war by investigators around the world, including Israel's Mossad, the U.S. Office of Special Investigations, and the Simon Wiesenthal Center," the AP says. Historian Johannes Tuchel, the director of the German Resistance Memorial Center, tells Reuters and Germany's Bild newspaper that he has found proof Mueller died in Berlin in 1945. After being buried first in a temporary grave at the Luftwaffe headquarters, Mueller was interred in a mass burial at a historic Jewish cemetery in Berlin, Tuchel says. Tuchel "reexamined evidence from a grave-digger after the war, in then communist East Germany," Reuters reports, "who remembered burying a man in a general's uniform in Berlin-Mitte Jewish Cemetery in 1945." The historian says he then cross-referenced military decorations and documents found on the body to data from German intelligence and the U.S. Central Intelligence Agency, as well as the Berlin archives. "The cemetery was desecrated by the Nazis and became the site of 16 mass graves for more than 2,700 people who died in Allied air raids and the fall of Berlin. It is now a Jewish memorial," according to Reuters. The news that a notorious Nazi war criminal might be in a Jewish cemetery dating from the 17th century has produced new frustrations in the Jewish community — particularly because its religious law forbids exhumation, and Mueller's body could be difficult to identify beyond a doubt. "The fact that one of the most brutal Nazi sadists is buried in a Jewish cemetery of all places is a distasteful monstrosity," Dieter Graumann, chairman of the Central Council of Jews, tells Bild, in a translation by Der Spiegel. "The memories of the victims are being grossly violated here." In 1945 and the years that followed, efforts to find the former Gestapo leader were made more difficult by the fact "Heinrich Mueller" is a very common German name, according to the biography assembled by the Jewish Virtual Library. "Ultimately the Allies would find many Heinrich Muellers in occupied Germany and Austria, but not the right one," the site says. "After [Adolph] Eichmann, a key architect of the Holocaust, was captured in Argentina in 1960 and taken to Israel to stand trial, he told his interrogators that he believed [Mueller] was still alive. Documents from Germany's Federal Intelligence Service (BND) apparently show that Western intelligence agencies, too, long believed that [Mueller] survived the war. In the summer of 1949, it was thought he was hiding in the Czech city of Karlovy Vary, and SPIEGEL reported in the 1960s on speculation that he was alive."